The Big Fail: Three Years With No Budget: What, Me Worry? If Budgets are Moral Documents, what are we to make of the lack of one… for over three years? Tom Barrett will win the Democratic nomination, beating Falk in the primary two Tuesdays from now. He will enjoy a boost in support from Democrats bent on revenge, but will be facing strong Republican turnout as well. Over 2.5 million votes will be cast. Walker wins, narrowly, as Milwaukee turnout fails to reach 2010 levels (but stronger than in the 2011 supreme court race). Several counties lost by Prosser flip back, narrowly. Geez, Chicago's Teachers Union and the Laborers... that's quite a combination. Biden's right. The President has a terrible and swift swoard, and that that provokes laughter a very bad thing however one spins this. Referring to President Roosevelt's foreign policy quote about "speaking softly and carrying a big stick," Biden told the crowd that Obama followed a similar path while negotiating with Iran. "I promise you, the president has a big stick. I promise you," Biden said as the crowd laughed. Fran Eaton's column in the Southtown Star on the Aron Del Mar fiasco and the Cook County GOP. United Republican Fund women from Will County talking H/T Illinois Review. Run this while scrolling past some of the babe-pics of the new Cook County Board Chair. Cook County GOP's in a world all it's own. It isn’t my Grandpa’s Cook County GOP anymore. Besides crass; Del Mar looks stupid. The whole odd story over at New Cook County GOP Chair has colorful bio - Illinois Review Update: More on Mr. Del Mar via Prairie State Reporter. SecState Clinton has a knack for picking guys who appear to have a need of a village to mind them. Cal finds plenty of Obama stickers at a ralley for Dee Beaubien. Valerie Leonard via Austin Talks. No excuses for anyone night seeing this trainwreck coming. Tell your alderman to vote ‘no’ for the Infrastructure Trust at Tuesday’s 10 a.m. special Chicago City Council meeting. The deal effectively transfers oversight of financing from the city to a nonprofit organization. The nonprofit is not subject to the same disclosures, open meetings and oversight as conventional general obligation bond financings orchestrated by the City of Chicago would be. The city would be on the hook for all the expenses and liabilities of the deal, while the nonprofit trust and financing companies would control the terms and reap the financial benefits. The long-term contracts will result in higher financing costs than the city could obtain under a general obligation deal. It’s not like the city has a poor credit rating and has to settle for higher interest rates. Via Prairie State Report. Save this link. The infrastructure trust will be the source of Rahm’s downfall. Mayor Emanuel’s attempt to ram the Infrastructure Trust through the City Council today is an abuse of power. It is the same kind of abuse that brought us the parking meter scandal and the sale of the Skyway to pay short-term bills. Like the midnight destruction of Meigs Field, it is an attempt to make public policy without debate or discussion. The Mayor has asked for new authority to spend money, on undisclosed projects, while bypassing the normal political process. The new Infrastructure Trust Authority is to be owned and operated entirely by the Mayor. Projects will be selected by the Mayor’s handpicked few, putting enormous political power in his hands. The intramural debate among the Democrats on this bill entirely misses the point. They are debating whether the Trust Authority should be subject to FOIA or ethics rules; whether there should be oversight by the Inspector General, and when projects should be disclosed. They are debating process when they should be debating substance. They do not ask whether we should be spending yet more money in the first place. Missing from debate is whether the City of Chicago should have yet another mechanism to go into further debt. Let’s keep in mind what an Infrastructure Trust is. It’s a goverment agency that uses private investment dollars to finance public projects. Private investors aren’t running a charity; they expect to be paid back, and at rates that exceed those typically earned by municipal bonds. The mechanism by which they are repaid is the revenue generated by these projects, in other words, user fees. Roads are financed by tolls. Stadiums by higher ticket prices. Parks by entrance fees. One way or another, the residents of Chicago get stuck with the costs. And what happens when projects fail? Or there are cost overruns, as there are on most government projects? Investors can walk away, or demand higher rates to finance future projects. They won’t take the hit. Instead, the taxpayers will be left to make up the difference. As always, in a city where the predominant party lacks fiscal restraint. Financing large, unnecessary projects at taxpayer expense has long been the way the Chicago Democrats operate. They flush the system with cash, dispense it to favored contractors, who in turn write checks back to their political sponsors. And the cycle continues, until the money runs out. That’s what has happened. The City and the State are financially under water. They can’t easily issue new bonds to fund projects. Borrowing is already out of control. There is structural debt, large projected budget deficits, and unfunded obligations. Hence the Infrastructure Trust. By bypassing the traditional bond process, and putting the authority into the hands of a small group of people appointed entirely by the Mayor, there is no longer a need to involve the political system. It’s another pot of money, even further removed from the control of voters. In smaller communities, voters routinely vote down proposals for new municipal bonds. Democrats know this. For the cycle to continue, the voters must be taken out of the process. And, apparently, the Aldermen as well. The Chicago Republican Party strongly urges City Council to vote the Infrastructure Trust down. Forget the content here, this is just plain junk education. It's not teaching protest.... this is just plain not teaching. If Budgets are moral documents what’s the morality of refusing to ever make one? Springfield’s sorely in need of one. Note the other members include current Senator and future Kane County Board Chair Chris Lauzen. Always amazing how high ranking people fumble questions like these from Walsh. Reason enough here to vote of Joe. Duckworth would lop softballs, just as she gave cover to Blagojevich on evading Veterans hiring rules. Note all the GSA officials miss Walsh's point they would manage the taxpayers dime better if they managed it as if it was their own. That went over everyone's head. As a friend of the URF, we're excited to announce to you that we're partnering with the American Conservative Union (ACU) to host a regional event in Chicago, Illinois. Scheduled for Friday, June 8, 2012, CPAC Chicago will energize and mobilize Midwestern conservatives, giving them the tools needed to defeat the liberal agenda in 2012, while also highlighting rising conservative stars in the region. CPAC Chicago, in partnership with the URF (home of Right Nation), will bring national and regional leaders together with local grassroots activists for a day of blockbuster speeches, policy discussions and networking opportunities -- all celebrating the shared URF LIFT principles of limited government, individual liberty, free enterprise, and traditional values. We look forward to seeing you on Friday, June 8! JJ the elder on Jesus occupying the temple (stay clear of those Bud distributorships though I'm sure). I'd call it theft of People's Property. ABC's puff peace on Occupy which will almost certainly not be non-violent includes an interview with conservative stalwart Rebel Pundit. Oddball Durbin on tornadoes and Chevy Volts while the real slaughter continues each weekend in Chicago. Sign on the gas pump. I supposed to believe the GOP’s at war with women when the administration quietly releases $1.5 Billion in Aid to Egypt? A real hero from Campton Hills Illinois! 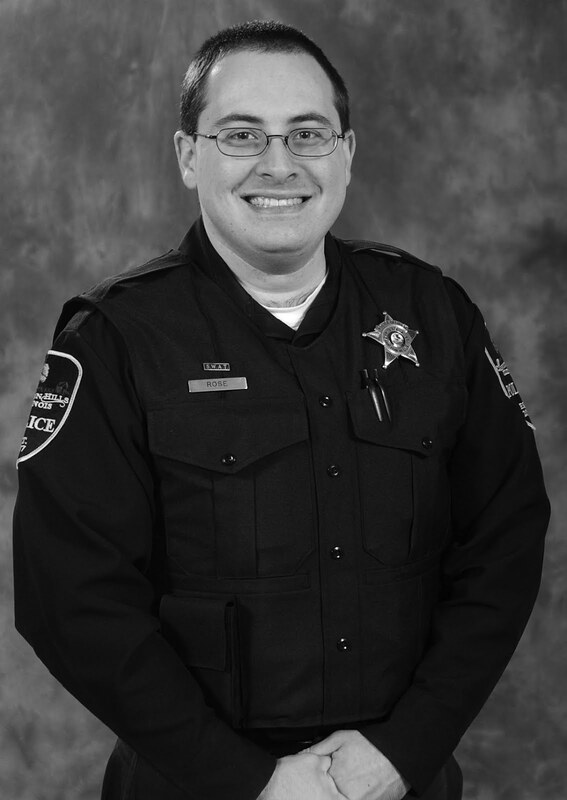 While working the midnight shift on August 28, 2011, Campton Hills Police Department, Officer Elliot Rose responded to a single vehicle motorcycle accident at Route 64 and Fabris Road in Maple Park. Though the accident was outside of the police department’s jurisdiction, Officer Rose responded. When he arrived on the scene, a motorcyclist had severed his leg and was bleeding heavily from the femoral artery. Officer Rose, a trained paramedic, knew he had to stop the bleeding immediately or the victim would die. Working without a medical kit, Officer Rose improvised using a piece of gauze and an ink pen. Probing into the wound, he located the artery, using the gauze-wrapped pen to pull the artery out slightly and clamp it, stopping the bleeding. He then tended to the victim’s other injuries before paramedics arrived. Officer Rose also had the foresight to have a medevac helicopter dispatched to Delnor Community Hospital in Geneva to be waiting for the victim when he arrived so he could be transported to a trauma center. The victim was stabilized and flown to Advocate Good Samaritan Hospital in Downers Grove. It is a big deal. I think the White House is engaged in a war on women. The Muslim Brotherhood, really? Do you know what their position is on reproductive rights and all these feminist issues, women in the workplace, equal pay for equal work? I don't think they are very good on that issue. And they are letting them in the White House. Mitt Romney should have a press conference tomorrow to say this proves that the President, Mr. Obama and Mr. Biden and Mr. Donilon and Mr. Lew and the male top-heavy White House staff doesn't care at all about the plight of women in Egypt. BRET BAIER, HOST: Egypt's Muslim Brotherhood of course helped push Hosni Mubarak out of power in Egypt and move in a more Islamist candidates inside the parliament there in Egypt. At the time they said they would not put a candidate up for president. Now they have. And now Muslim Brotherhood officials have met with the mid-level White House officials about way forward in Egypt, that meeting happening at the White House on Tuesday. We're back with the panel. Bill, is this a big deal, people who are critical of it? What about it? BILL KRISTOL, EDITOR, THE WEEKLY STANDARD: It is a big deal. I think the White House is engaged in a war on women. The Muslim Brotherhood, really? Do you know what their position is on reproductive rights and all these feminist issues, women in the workplace, equal pay for equal work? I don't think they are very good on that issue. And they are letting them in the White House. Mitt Romney should have a press conference tomorrow to say this proves that the President, Mr. Obama and Mr. Biden and Mr. Donilon and Mr. Lew and the male top-heavy White House staff doesn't care at all about the plight of women in Egypt. I'm partly kidding, I'm mostly kidding, there are other reasons not to deal with the Muslim Brotherhood, but I'm trying to make the point about how ludicrous the war on women moralizing is. And incidentally, this is a tough policy now that they are dealing with the situation they are dealing with. I don't -- I think ultimately the failure to deal with Syria, the failure to deal with Iran is what the administration is going to be judged on more than this complicated minuet with the different groups of Egypt. Wonder what Tammy Duckworth has to say? Rep. Joe Walsh, R-IL, got a look at that poster being posted around the Department of Labor showing Secretary Hilda Solis marching arm-in-arm with Rev. Al Sharpton and started asking some possibly uncomfortable questions. If that sounds familiar, it should as it's standard SEIU/ACORN rhetoric. Walsh thinks the poster and the political ideology it represents has little if anything to do with being Secretary of Labor. "Some employees that have remained anonymous have described these posters as 'propaganda' and I agree," Walsh wrote in a letter to Solis. "The sign is both contrary to the role of your department and a misuse of taxpayer funds. Your job is not to inject yourself into politics - especially not by promoting your own political stance through a poster paid for by the taxpayer." Not the poor so much as the middle class. That's who's wiped out with inflation. Fran’s conclusion from a great column comparing Illinois and Wisconsin. We live in strange times. Quinn faces a budget crisis and rising debt, a considerable amount of which stems from some of his biggest campaign contributors — public sector unions. Meanwhile, Walker boasts of no income tax increase, lower property taxes and a balanced fiscal 2013 budget. And who between Quinn and Walker is facing historical political pressure and the possible removal from office? It’s not Quinn. Cal Skinner gets a scoop. Plenty of comments stacking up on this one. Multiple sources have contacted McHenry County Blog with the news that State Rep. Mark Beaubien’s widow Dee is telling people she is running for State Representative against Republican winner Dave McSweeney. Some of those sentenced to long terms of labor were labeled “Muklů, an acronnym which translates from Czech to mean men designated for liquidation. Quite simply, they were not expected to survive the camps and with the regime counting on their deaths far before they approached the ends of their sentences. Brutal conditions in the mines and the camps, hastily erected wooden barracks, often with rudimentary facilities and rations and privileges, such as receiving letters, based on meeting or exceeding work quotas, meant that many prisoners aged prematurely or became chronically ill. Prison authorities in some cases agreed to send them home when it was clear they only had a few months to live. Air looks pretty thin there. President Obama told us yesterday SCOTUS ruling against Obamacare would be an unprecedented move by the court. Yet a fellow who lived only a few blocks from Obama, Clarence Darrow; was once asked by FDR to review a similarly controversial law in the 1930s: the National Recovery Act. Darrow, to FDR's surprize, didn't much care for Congress's overreach with the NRA, and said so before a Congressional Committee once FDR finally released Darrow's report. The University of Minnesota has Darrow's testimony online. SCOTUS went on to strike down the NRA, and FDR went on with a futile war against the court with his court packing scheme. Darrow himself can be heard below speaking out against the New Deal and the NRA in words as applicable now as then. It's strange a Professor of Constitutional law wouldn't understand the unconstitutionality of Obamacare. It's unChicagoan a lawyer from Hyde Park would have forgotten Darrow's words. He's a mythic figure Chicagoans of a progressive sort once grew up with. That kind of Liberalism long passed it seems. Jeremy's latest video of Occupy in Milwaukee protesting Rahm's visit. Geez has Ed Sadlowski gotten fat! I was in the Steelworkers union in Chicago with him in the 70s. It was a different sort of Union movement then, and a different Ed Sadlowski. A guy who went to the Supreme court defending donations as free speech by the way when the USW establishment went after him for taking outside money to run against them. Hey, I’m sure it’s only fair. But buried within the legislation was something considerably less altruistic: a provision that enabled a member of one of Chicago’s better-known political families to boost his pension by more than $30,000 a year — while saddling unsuspecting taxpayers in Oak Brook with nearly $750,000 in funding liabilities, the Chicago Sun-Times and Better Government Association have learned. The recipient of that larger pension, Thomas Sheahan, is a former police chief in Oak Brook, the current village manager in Lyons and a member of a Democratic clan that has helped rule Chicago’s Southwest Side for decades. via the Weekly Standard. Elizabeth Warren on the Keystone Pipeline. Illinois Pay to Play exploring some strange turns in the CPS Milk Story. The series seemed odd to me and especially on the Daniel T. Frawley whistle blower complaint.